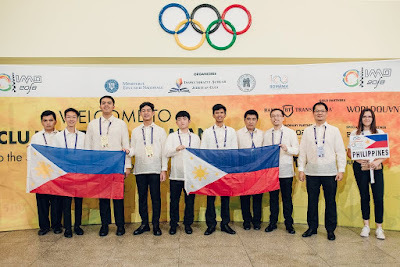 HARI Foundation, Inc. (HFI), the corporate social responsibility (CSR) arm of Hyundai Asia Resources, Inc. (HARI) congratulates the Philippine team of young math aces for once again bagging top honors at the 59th International Mathematical Olympiad (IMO), the world’s largest and most prestigious mathematics competition for high school students. The competition was held in Cluj-Napoca, Romania, from July 3 to 14, 2018. HFI is on its second year of supporting the Philippine team’s participation in the IMO. Ms. Agudo is a staunch advocate of youth empowerment through education. This year’s team was composed of Emmanuel Osbert Cajayon of Emilio Aguinaldo College, Kyle Patrick Dulay of Philippine Science High School-Main Campus, Andres Rico Gonzales III of Colegio de San Juan de Letran, Albert John Patupat of De La Salle University Integrated School, Shaquille Wyan Que of Grace Christian College, and Sean Anderson Ty of Zamboanga Chong Hua High School. Training and guiding the team of students were Team Leader Dr. Richard Eden and Deputy Team Leader Dr. Christian Paul Chan Shio from the Ateneo de Manila University and Mr. Carlo Francisco Adajar from the University of the Philippines-Diliman. Patupat bagged a gold medal; Dulay won silver, while Cajayon and Que picked up bronze medals. Gonzales and Ty both received honorable mentions for garnering a perfect score in one of the written examination’s problems. These achievements now bring the country’s total medal count to 57—23 honorable mentions, 23 bronzes, eight silvers, and three golds. The yearly Philippine delegation to the IMO is organized by the Mathematical Society of the Philippines (MSP), the country’s premier mathematical professional organization. Team members are chosen at the end of a grueling selection program handled by MSP trainers and participated in by the national finalists of the latest Philippine Mathematical Olympiad.